It’s been a busy few weeks at the races, busy collecting hardware that is. Chad sets a new 5k PB at the RumpShaker 5k. Two weeks later he wins the Double Oak duathlon by storming to the front at the turn around on the bike and throttling his competition. 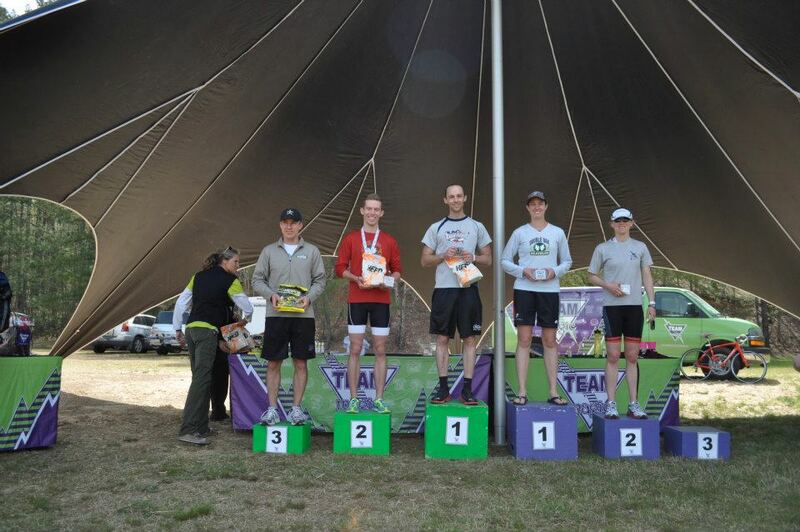 Chad Williamson Double Oak Duathlon Winner! Janine fresh off her AG win at IM Melbourne wins a race in the Telstra Triathlon Series in Western AUS. She managed to top all the elite women using her run speed to move onto the top step of the overall podium. She’s in a tough spot. The age group women want her to get her elite license, the elites want her to stay age group. James finished 2nd overall in a hard fought battle at the White Lake Half. He battled rather chilly water, waves and wind to grab the lead late on the bike and hold it until 2 miles on the run. I’m looking for good things to come from james this season as he’s dedicated himself like never before. Of course if he tried training this much before, he’d have cried, a little, every day. Billy won his age group and finished 7th overall at the series opener of the Tucson Triathlon series. Dusty, Lora and Mr. I want to Bulk Up Randy all grabbed 2nd in their cateogries at TT’s in their respective area’s of the country. Mike snagged 3rd overall in a 10k running a huge negative split, which foiled many a person’s plan to outrun him over the last 5k. You know the best things about coaching such a hard working group of girls and guys? Keeping track of their results.